When were the first helix-supported deep foundations installed? 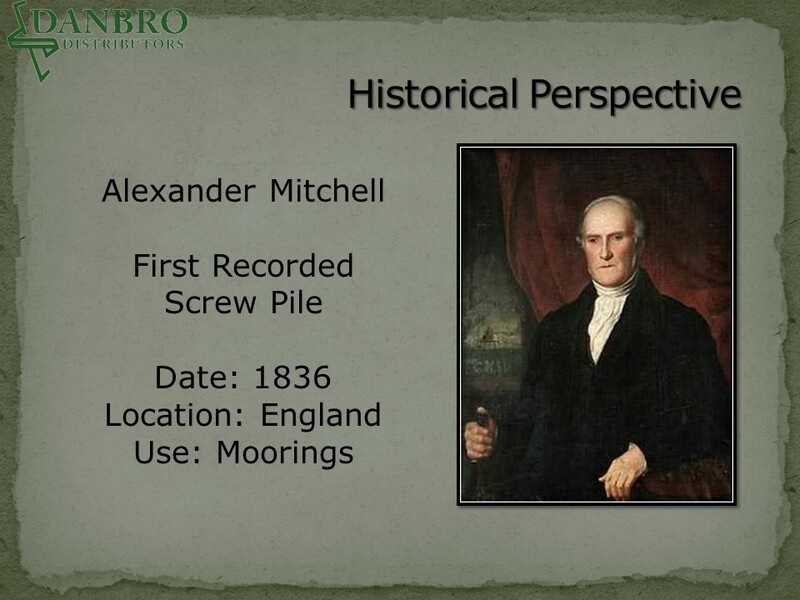 The helical pier was invented by a blind Englishman, Alexander Mitchell, in the 19th century. 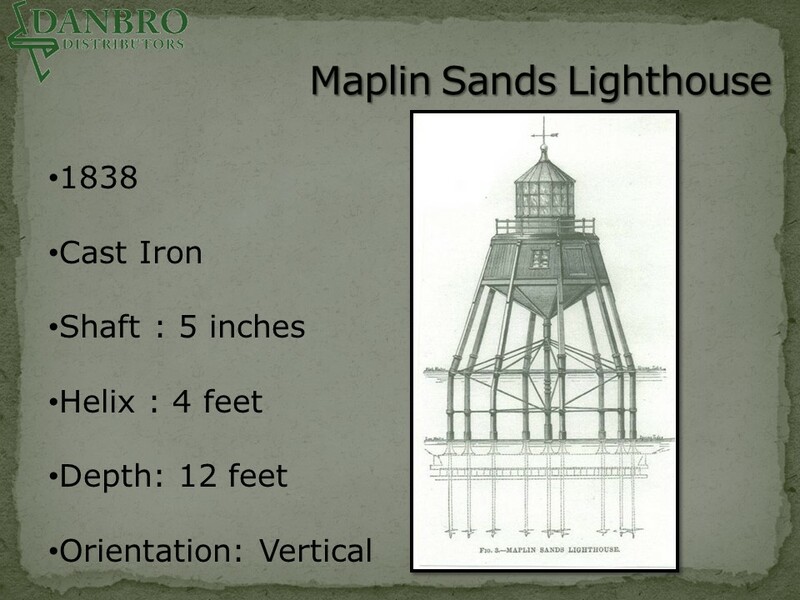 It was first used in compression under the Maplin Sands Lighthouse in the Thames River in 1838. In the early 19th century, foundation technology consisted of stacking large stone blocks on good bearing soil to support structures. However, this technology did not work in the soft mud at the bottom of the Thames River in England or the Chesapeake Bay in America. 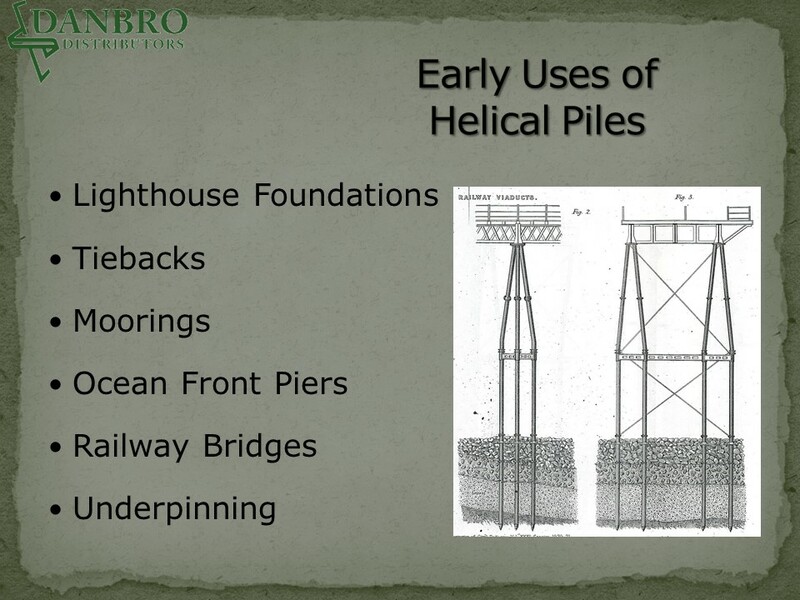 Unlike today’s engineered, galvanized products, those piles and helices were constructed out of cast iron. The pile consisted of an 8- to 12-inch diameter pipe shaft with a single 24- to 36-inch diameter helix at its base. Barges were positioned around the pile shaft; horses or mules were attached to the pile shaft with arms coming off the pile. The animals walked clockwise around the pier, screwing it into the soil below the water to the correct bearing depth or refusal. Helicals came to America in the mid-1800s to support lighthouses at sea. The Hooper Strait Lighthouse, built on helical piers in 1879 in the Chesapeake Bay, was among the first constructed here. At that time, helical pier technology was already 43 years old. 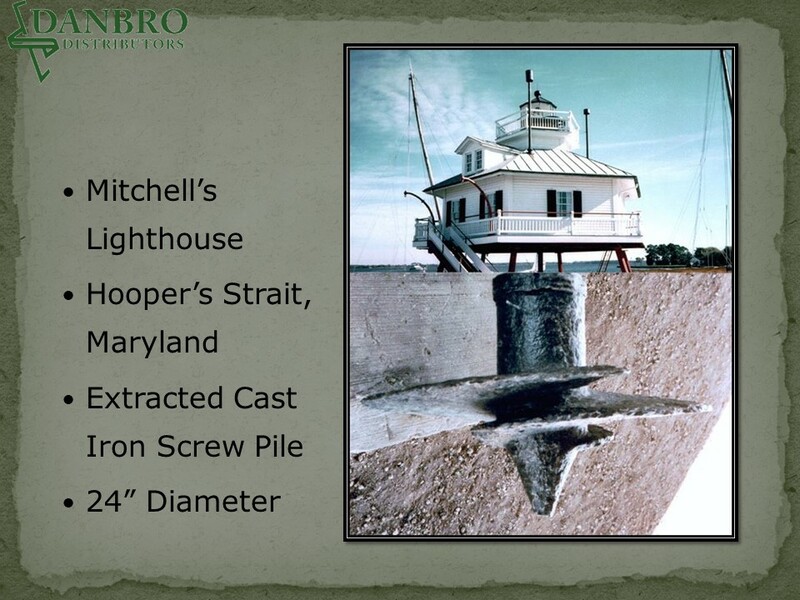 In 1966, it was determined that the Hooper Strait Lighthouse was no longer needed in the Chesapeake Bay and it was retired to the Chesapeake Maritime Museum in St. Michaels, Maryland. One of the original helicals was extracted to demonstrate resistance to corrosion and is now on display as part of the exhibit. When I entered the helical pier and anchor business in 1989, it was still not a widely known or frequently used deep foundation option. Convincing engineers that this slender shaft and plates would support their building and wall was not easy. The Mitchell story and the Hopper Strait Lighthouse opened many eyes to the opportunities provided by helicals. When I started as a territory sales manager in 1989, the helical pier was more than 150 years old. By 1989, the helical pier was hot-dip galvanized for corrosion protection, had a slender high-strength steel shaft, and had multiple helices. One of the more recent developments has been the use of large diameter pipe piles with large diameter helices supporting higher capacities. The brackets also have evolved so that they are now well designed and much easier to install for many applications. Additionally, the hydraulic drive heads and torque indicators are now in the 21st century with a strain gauge, Bluetooth and differential pressure indicators available – a far cry from the old, original shear pin indicator of yesteryear. They worked well, but you spent a lot of downtime changing the pins. 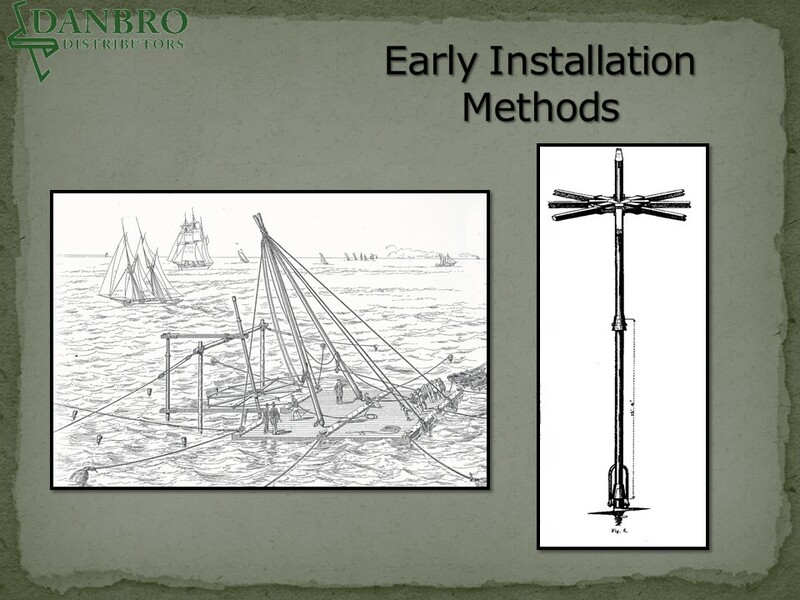 The helical pier industry has come a long way since those early days. At Danbro, we will continue to select products and equipment best-suited to your projects. We welcome further innovative ideas as the helical future looks bright with Danbro’s new supplier, IDEAL Foundation Products. Perhaps someday your project may be cited as a landmark in the almost two-century-old history of helical piers.